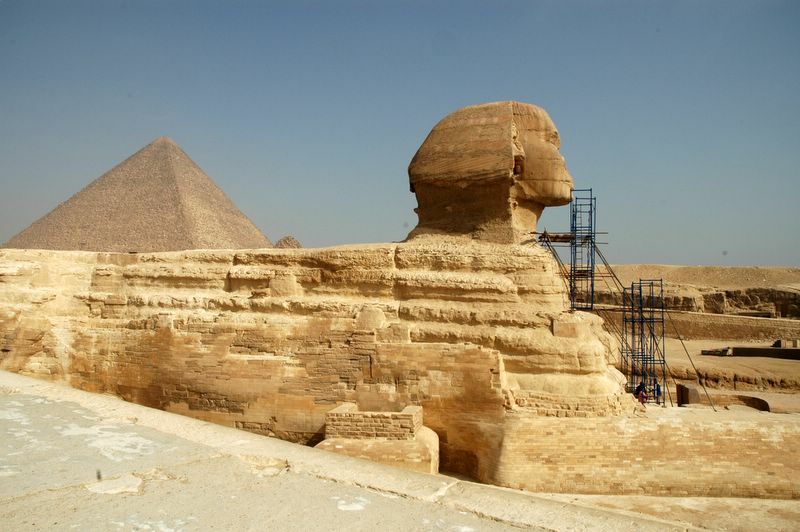 The Sphinx of Giza, a statue with the body of a lion and the head of a human is just as mysterious as the pyramids. It has a height of 20 m and a length of 70 m and is supposed to be built about 2500 B.C. out of a solid rock mountain at the plateau. The three Pyramides of Giza. They are located about 10 km southwest of Cairo in the Libyan Desert. The biggest is ascribed to the pharaoh Cheops and is supposed to be built in the 4th dynasty about 2690 B.C. over a 20 year period. It is made from limestone from the Mokattam Mountains near Cairo. Its height is 140 m and its lateral length 230 m. The second is suppose to be built by pharaoh Chefren about 2650 B.C. and its height is 136 m. The smaller one with a height of 63 m is supposed to be built by pharaoh Mykerinos about 2600 B.C.